Responsible firearms owners use their firearms safely and understand the need to prevent their firearms from getting into the wrong hands. They also know that firearm safety should be a priority if we want to better protect our children, prevent avoidable injury, and keep our communities safe. The National Crime Prevention Council (NCPC) and The Advertising Council, Inc. (Ad Council) have created a Safe Firearms Storage public education campaign to encourage firearms owners to store firearms safely by locking them up where children, at-risk youth, potential thieves, and those who intend to harm themselves or others, cannot access them. The ad campaign also asks firearms owners to report any lost or stolen firearms to local law enforcement immediately. 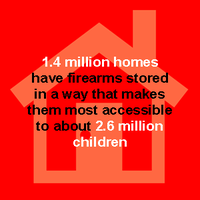 According to a study by the RAND Corporation using statistics from the United States Centers for Disease Control and Prevention, approximately 1.4 million homes have firearms stored in a way that makes them accessible to the wrong hands, -- children, at-risk youth, potential thieves and people who intend to harm themselves or others.